We braved the historic snow blizzard and pulled together as a community to look out for our most vulnerable residents. I thank you for stepping up and helping out your neighbor. I often speak at great length about “community,” as it relates to quality of life issues and public safety. We are really in this together. Just a few days after the record snow storm, the Committee on Judiciary passed my comprehensive crime bill (referred to as the NEAR Act), which was also passed on first reading by the full Council on February 2, and will go before the Council for a final vote on Tuesday, March 1. I want to thank you for your valuable input which helped shape this landmark legislation. We relied heavily on community engagement, experts from the District, and across the country, and data to develop a legislative package that addresses the underlying issues that impact crime. As a result the NEAR Act takes an innovative public health approach to crime prevention. Using a public health approach ensures that the District will implement a sustainable proactive solution to crime. Many residents have expressed an interest of having the NEAR Act placed on the agenda at community meetings. My team and I are happy to discuss the bill, take your questions and comments and address any concerns that you may have. We regret to inform you that Councilmember McDuffie’s father Mr. Gregory McDuffie, Sr. passed away on Wednesday, February 3, 2016. We ask that you keep the McDuffie family in your prayers as they mourn the loss of their loved one. The home-going celebration is Wednesday, February 10, 2016 at Reid Temple AME Church located at 11400 Glenn Dale Blvd, Glenn Dale, Maryland 20769. The viewing begins at 10:00 a.m. followed by a service at 11:00am. Condolences may be sent to Councilmember McDuffie at 1350 Pennsylvania Avenue NW Washington D.C. 20004. On Tuesday, February 2, the Council voted unanimously in support of Councilmember McDuffie’s “Neighborhood Engagement Achieves Results Amendment Act of 2016 (NEAR Act)”, a comprehensive bill that re-calibrates how the District approaches public safety, by not just addressing crime after it occurs, but rather working to prevent crime by treating its root causes in a long-term, sustainable way. The NEAR Act addresses crime in several ways, including using a public health approach that requires the collaboration of the Metropolitan Police Department (MPD) and health and human services agencies. The NEAR Act will establish an Office of Violence Prevention and Health Equity (OVPHE). The OVPHE is a recognition of the years of research that show that violence is a public health problem. OVPHE will require the city to develop and implement a public health strategy using risk assessment tools, cognitive and family based therapy, and service coordination to combat the spread of violence, including placing clinicians in every hospital’s emergency department to respond to victims of crime immediately and prevent violence from escalating the minute they are brought in. The NEAR Act also creates an Office of Neighborhood Safety and Engagement (ONSE). Based on the successful Richmond, CA model, the goal of the office will be to identify our teenagers and young adults at the highest risk for committing or being a victim of violent crimes, for participation in a stipend-based program involving life planning, trauma­ informed therapy, and mentorship. The program will require its participants to create and execute a successful life plan, moving them away from the pitfalls of violent crime. Evidencing the potential success of ONSE, between 2007 and 2014, Richmond experienced a 76% reduction in firearm­ related homicides. We also know that those impacted by homelessness, mental health disorders, and substance abuse are often in regular contact with the police due to unmet healthcare and housing needs. The NEAR Act establishes a Community Crime Prevention Team Program to pair mental health clinicians and housing outreach specialists from the Departments of Behavioral Health and Human Services with police officers to identify individuals in need of assistance and to connect them with wrap-around services. Finally, the legislation requires MPD to provide annual training on preventing biased-based profiling; community policing; and the use of force. MPD is also required to collect stop and frisk and use of force data in an effort to promote transparency and improve police-community relations. On January 26, the Committee on the Judiciary and the Committee on Business, Consumer, and Regulatory affairs held a hearing on two employment discrimination measures. The first, authored by Councilmember McDuffie – the “Fair Credit History Screening Amendment Act of 2015” – would remove barriers to gainful employment by prohibiting an employer from considering a job applicant’s credit history until after a conditional offer of employment has been made. Prospective employees would be able to file complaints with the Office of Human Rights for violations of the act. The Council passed similar legislation in 2014 – co-introduced by Councilmember McDuffie –to “ban the box” by prohibiting the consideration of an applicant’s criminal record pre-offer. The second measure – the “Employment Protections for Victims of Domestic Violence Amendment Act of 2015” – would require employers to make reasonable accommodations in the workplace for survivors of domestic violence, sexual assault, and stalking. Survivors often face a variety of challenges finding and retaining employment because of the ongoing actions of perpetrators or biases they may encounter. Under the bill, employers would be prohibited from discriminating or otherwise retaliating against survivors. On February 4, the Council began its annual agency performance and budget oversight season. Residents are encouraged to testify in person on agency programs or constituent issues. The oversight calendar can be found here. On Tuesday, February 2, Councilmember McDuffie was joined by the D.C. 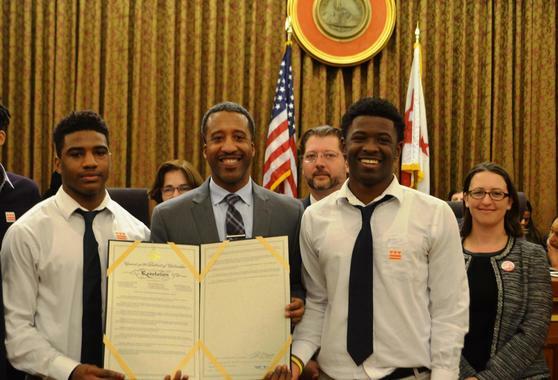 Coalition Against Domestic Violence and Break the Cycle, as well as students from Friendship Collegiate Academy and Men of Code to present a resolution to recognize February as National Teen Dating Violence Awareness and Prevention Month (Teen DV Month). Studies show that 67% of teens in abusive relationships never report the abuse to anyone. We encourage you to start conversations about the importance of healthy relationships and join the DC Coalition Against Domestic Violence (DCCADV) for Respect Week DC February 8-12. Respect Week DC was created by LoveisRespect’s National Youth Advisory Board as a unique way to engage young people, community leaders and advocates on raising awareness during Teen DV Month. DCCADV has also planned a number of interactive events during February to foster conversations about healthy relationships, support youth leadership in ending dating violence, and provide educational materials for parents, educators, and community members. Please see Respect Week DC Toolkit for the Dating Violence Awareness Month calendar. Calling our young professionals! You don’t want to miss this! 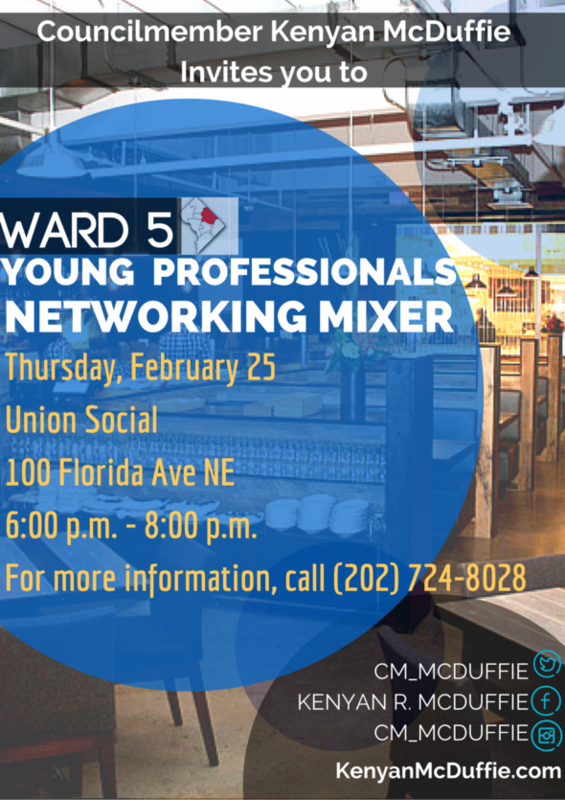 Mark your calendars for the Ward 5 Young Professionals Networking Mixer on Thursday, February 25, from 6:00 p.m. – 8:00 p.m. at Union Social located at 100 Florida Avenue N.E. Join in on the fun, connect with new people. See you there! The D.C. Office on Aging (DCOA) and the Department of Housing and Community Development (DHCD) launched the “Safe at Home” program to promote aging-in-place for individuals 60 years of age or older and persons living with a disability by offering up to $10,000 in home accessibility adaptation grants that reduce the risk of falls. Eligibility requirements include: D.C. resident who owns or rents their home; 60 years of age or older or between the ages of 18 and 59 living with a disability; household income at or below 80% of the Area Median Income. Click here for information about enrollment. In accordance with the “Air Quality Amendment Act,” as authored by Councilmember McDuffie, the District Department of Energy & Environment (DOEE) has launched its new online nuisance odor complaint service through 311. Consumers may provide the date, time and location of the outdoor nuisance odor, as well as its suspected source. DOEE will use the complaint as the basis for an investigation and may take an enforcement action if the investigation confirms the complaint.